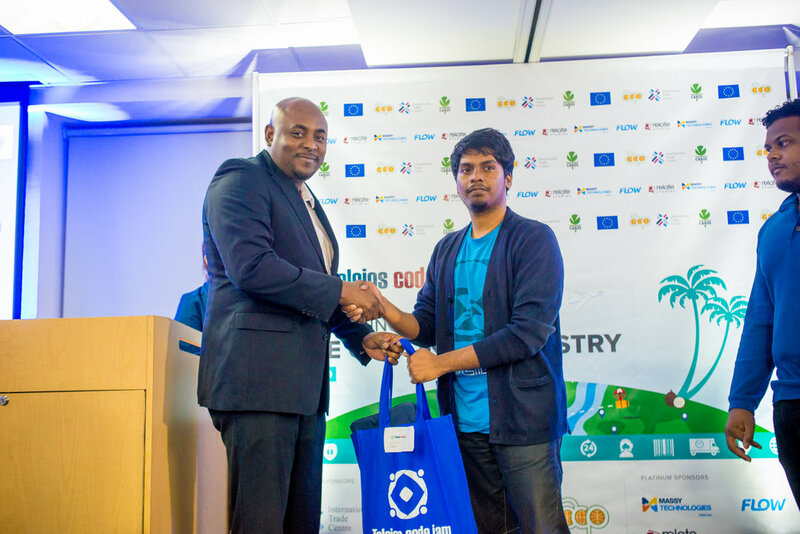 We celebrated the 10th edition of Teleios Code Jam on November 8, 2018 at Microsoft’s Head Office in Trinidad. 10 years of Teleios Code Jam made for some pretty special memories. We’ve explored themes from SMS-based applications to solutions that feature regional impact. While reviewing some of those beats at the TCJ Awards, we discovered that more than one hundred teams of students participated in the TCJ programme over the years. This year, 12 teams participated in the TCJ Programme. Our theme was “Innovating the Coconut Industry”. We used the Teleios QuikWorx platform as the key development tool for this year’s TCJ. Students were introduced to QuikWorx via the TCJ Training Day. The mandate for the students was to build solutions for the Caribbean coconut industry using QuikWorx and other technologies. Eight teams attempted to build solutions and three emerged with stellar approaches to the challenge. Team Bits Please created a solution that provides an online registry for stakeholders in the regional Coconut industry. The members of Bits Please were Stephen Seenath, Aaron Meighoo, Joseph James, Alexandra Samaroo and Seenath Gooding. Team CodeCodeNut created Coconut Drop, a marketplace to revolutionize the Coconut Industry by connecting producers and buyers. The members of CodeCodeNut were Caleb Beard, Avidesh Bissoon, Daniel Gladstone, Daniel Gordon & Fawwaz Hosein. Team Compass created a decentralized app utilizing a block-chain to provide immutable and transparent farm-to-fork trace-ability for everyone on the supply chain from farmer to consumer. The members of Compass were Darien Jardine, Jonathan Herbert, Reshawn Ramjattan and Nirvan Sharma. Team Winnovators presented a solution called Waste Nut, Want Nut, to enable non-traditional stakeholders in the coconut industry to get in, by creating a marketplace for anyone with a coconut tree in their homes to access those interested in purchasing. The members of Winnovators were Zexal McLeod, Ajay Chaitoo, Adrian John and Jamal Emmanuel. There were teams that could not participate in the Presentation and Grand Submission stages of TCJ this year, however, there were other spaces to engage the TCJ programme. The UWI and SBCS joined with Teleios in providing locations for the TCJ Challenge. Quite a few teams turned out for the TCJ Challenge Stage. This year’s TCJ offered a prize the teams who won at each Challenge event. Team OJ, Omari Lawrence and Justin Ramjattan receiving their prize from Dr. Ulrich Thiessen, Cooperation Programme Manager, Delegation of the European Union to Trinidad and Tobago. Team CodeCodeNuts, Caleb Beard, Avidesh Bissoon, Daniel Gladstone, Fawwaz Hosein and Daniel Gordon (absent from photo). In the 2018 edition of Teleios Code Jam, TCJ10, we awarded three teams with the top prize of $10,000.00! Our winners are flanked by this year’s sponsors, Barton Clarke, the Executive Director of CARDI, Learie Roberts, Marketing Manager of Massy Technologies InfoCom, Kevin Khelawan, COO of Teleios Systems and Juma Bannister, Co-founder of Relate Studios. Our other platinum sponsor this year was FLOW. Many thanks to Microsoft for providing the venue for TCJ 2018 Awards!